On my way from Saint Mary’s Cathedral back to the bus to Askeaton earlier this week, I crossed through the Potato Market, which faces the West Door of the cathedral, and over the Sylvester O’Halloran Footbridge, which crosses the Abbey River at the point where it flows into the River Shannon. The Sylvester O’Halloran bridge is part of the Arthur’s Quay Park walkway and connects the Potato Market to the Hunt Museum. It is worth crossing simply for beautiful views it offers of the River Shannon, and many people use it daily on their way between Saint Mary’s Cathedral, King John’s Castle and the Hunt Museum. A large amount of money was spent in the late 20th century and early 21st century on redeveloping areas of Limerick and renovating many of the old buildings. 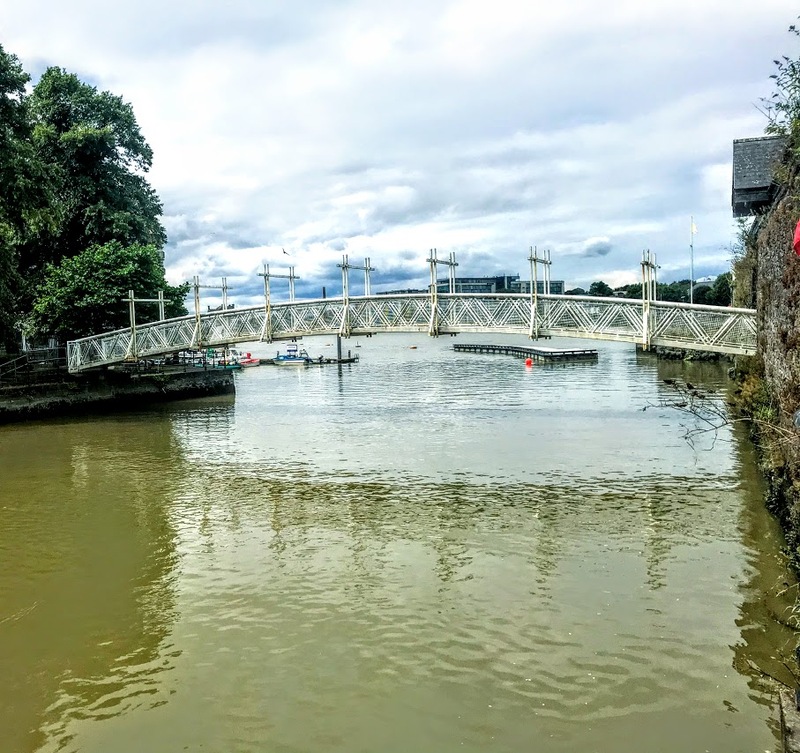 When Arthurs Quay was renovated in the late 1980s, a new walkway was placed along the waterfront and O’Halloran Bridge was built in 1987 as a link for the Hunt Museum and the Potato Market. 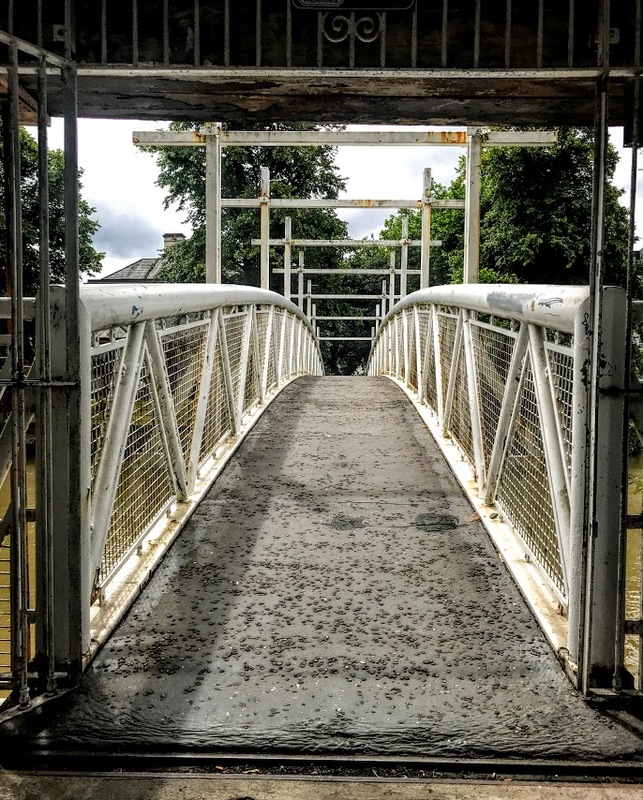 The bridge is 105 ft in length and originally the colours white, grey and black were suggested, but the architect Hugh Murray decided on blue to make the structure more noticeable. The colour of the bridge was changed to white in April 2008. When Limerick Civic Trust and City Hall disagreed about the name of the bridge, two former Mayors, Jim Kemmy and Frank Prendergast, secured the name honouring Dr Sylvester O’Halloran (1728-1807), a Limerick surgeon with an influential interest in Gaelic poetry and history and who lived and practised in Limerick for most of his life. Sylvester O’Halloran was born in 31 December 1728, the third son of Michael O’Halloran, a prosperous farmer at Caherdavin, Co Limerick, and his wife Mary McDonnell. His father is said to have fought in the Siege of Limerick in 1691. He was named after Sylvester Lloyd, the Roman Catholic bishop of Killaloe (1728-1739). Sylvester and his brothers went on to a school in Limerick run by Robert Cashin, the Church of Ireland Archdeacon of Limerick. Cashin’s son, also Robert Cashin, was Prebendary of Saint Munchin's in Limerick Cathedral, Vicar General of Limerick, Ardfert and Aghadoe, and Archdeacon of Ardfert (1767-1782). Sylvester’s brother, Joseph Ignatius O’Halloran (1720-1800), became a Jesuit priest and was professor of rhetoric, philosophy and theology at the Jesuit College in Bordeaux before returning to live in Cork. Another brother, George O’Halloran, became a jeweller and a property-owner. Sylvester went to London to study medicine at the age of 17. He continued with further studies in Leyden and in Paris, under the anatomist and academician Antoine Ferrein. In France, he was impressed with the Académie Royale de Chirurgie, founded in Paris in 1731. He was a founder of the Co Limerick Infirmary in 1761. The infirmary began with four beds in 1761 and moved to larger premises at Saint Francis Abbey in 1765. The foundation stone of the original infirmary is now in the Sylvester O’Halloran Post-Graduate Centre at University Hospital, Limerick. O’Halloran wrote several learned treatises on medical matters, including His medical publications included A New Treatise on Glaucoma, or Cataract in Ireland (1750) and A New Method of Amputation (1765). His Proposals for the Advancement of Surgery in Ireland (1765) was instrumental in founding the Royal College of Surgeons in Ireland (RCSI). He was made an honorary member of the new Dublin Society of Surgeons in 1780, and when the RCSI received its charter in 1784 he was elected an honorary member, the equivalent to a Fellowship today. O’Halloran was elected President of the Free Debating Society in Limerick in 1772 and was elected to a committee in 1783 that examined the Shannon navigation. O’Halloran collected Gaelic poetry and historical manuscripts, and his many publications included An Introduction to the Study of the Antiquities of Ireland (1772), Ierne Defended (1774) and A General History of Ireland (London 1774, two volumes). His interest in Gaelic history and poetry was driven by the historian James Macpherson (1736-1796) and his use of Gaelic tales of the Fianna. In the debate about Macpherson’s work, the Ossian Controversy, O’Halloran publicly denounced Macpherson’s work as a forgery in 1763, and he soon became renowned as a Gaelic antiquarian. His correspondents included Edmund Burke and Charles O’Conor of Belanagare. His learning was recognised when he was elected a member of the Royal Irish Academy in 1787. When Charlotte Brooke published the first English-language compendium of Irish poetry, the Reliques of Irish Poetry, in 1789, she credited O'Halloran for lending his manuscript collection and for writing the essential history underlying her anthology. The historian JC Beckett (1912-1996) includes O’Halloran among those aiming to vindicate achievements in pre-Norman Ireland. Mary O’Halloran died in 1782. Sylvester O’Halloran died on 11 August 1807 and was buried in Saint Munchin’s graveyard in Killeely, now a suburb of Limerick. His youngest son, Major-General Sir Joseph O’Halloran (1763-1843) of the East India Company, was the father of Thomas Shuldham O’Halloran (1797-1870), who gave his name to the suburb of O’Halloran Hill in Adelaide. In time, all O’Halloran’s descendants emgrated to Australia. When the bridge was built, the Australian ambassador to Ireland, Frank Milne, visited the bridge in memory of his great-great grandfather.